The RE Store’s Seattle field crew is accustomed to being under the gun. 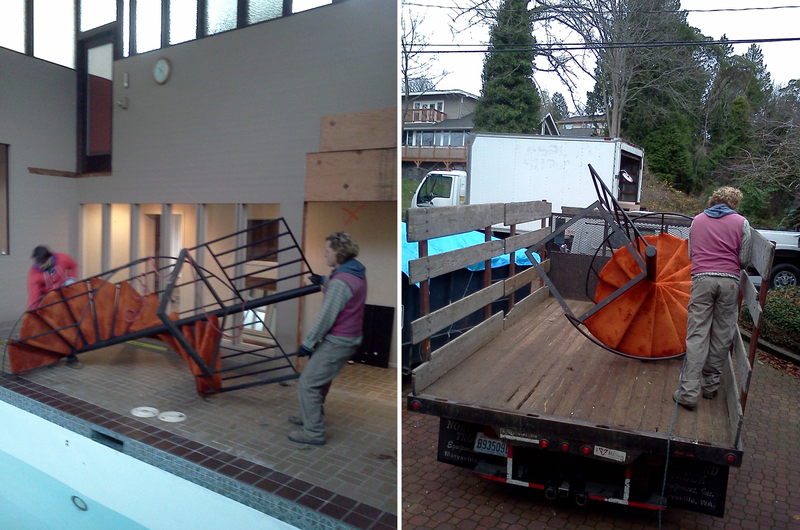 On a typical day we juggle multiple salvage jobs and/or material pickups across the Puget Sound area. Our schedule is constantly changing to accommodate the priorities of the homeowners, contractors and other organizations whose donations keep us rolling. This means that we’re often the last out of a building that’s set for demolition, but sometimes, we’re lucky enough to be inside of it while it’s being torn down. That was the case earlier this January when we were given a narrow “window” of opportunity to salvage, well, windows from a historical Broadmoor mansion. We knew we had to work quickly because the home was slated for demolition the following day. What we didn’t know, however, was that a Caterpillar excavator would be starting the process as we salvaged windows, doors, and other fixtures simultaneously from the circa 1928 home. Removing windows under ideal conditions can be a time consuming process depending upon window type, the quality of the installation, and the building’s siding material. This particular salvage, however, went surprisingly quickly. Maybe the time flew due to our habit of singing show tunes while we work, or perhaps it was just the unnerving rumble of the excavator scraping the brick façade off of the house that motivated us. Either way, we managed to salvage around fifty windows and a dozen interior and exterior doors. Working near heavy equipment isn’t always fun, but you sure do miss it when it’s not around. This is especially true when you have to move a steel spiral staircase the old fashioned way. It’s extra especially true when you have to thread that same staircase around the deck of an indoor pool, and then corkscrew it through a narrow hallway, and then load it onto a truck by hand. That’s right kids; we didn’t even use a furniture dolly. There’s nothing quite as fine as an orange shag carpet-clad, steel spiral staircase. So, dear reader, you can surely understand why we had to rescue this beauty from its lakefront home in Yarrow Point. Originally, it provided direct access from the master bedroom to the indoor pool below. Once we got it situated in the store’s back lot, yours truly and the rest of the field crew had the pleasure of reloading this shaggy spiral gem on the truck (by hand) and delivering it. She now has a new home at the Ballard based Four Freedoms Liquor Company. And thus the spiral is complete.